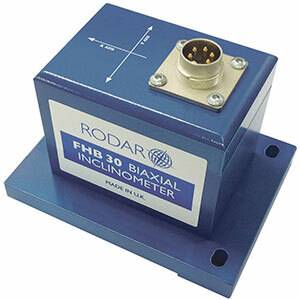 RODAR has announced the launch of its NEW FHB and FHU Range of Dual and Single Axis, In-Place Inclinometers. These new Inclinometers provide the same Precision, Repeatability and Temperature Stability of the DHBY/X Range but in a format suitable for easy inclusion in a wide Range of Tilt Measurement Systems. For over 25 years RODAR has been manufacturing High Precision, Dual and Single Axis Inclinometers for the demanding Environment of Geotechnical Instrumentation and particularly for inclusion within an Inclinometer Torpedo for Bore Hole Deviation Monitoring. All of RODAR’s Inclinometers are Gravity Referenced Transducers utilising the well established Servo-Accelerometer principle of a Pendulous Mass attached to a Torque Balanced, Fluid Damped System. Operating from a Single Unregulated DC Supply from 5.5V-35V with extremely Low Current Consumption of 5mA or less the entire RODAR Range incorporates Automatic Temperature Compensation to provide Highly Stable Outputs over a wide Temperature Range. This entry was posted in News and tagged Measurement. Bookmark the permalink.